The high throne legs were constructed from a dead Snakeskin Maple tree that needed to be felled at VanDusen. The King and Queen need to sit high up to admire their vast lands. Lived In. The Magnolia leaves used to cover the chair turned the color of patinated leather after a few months. 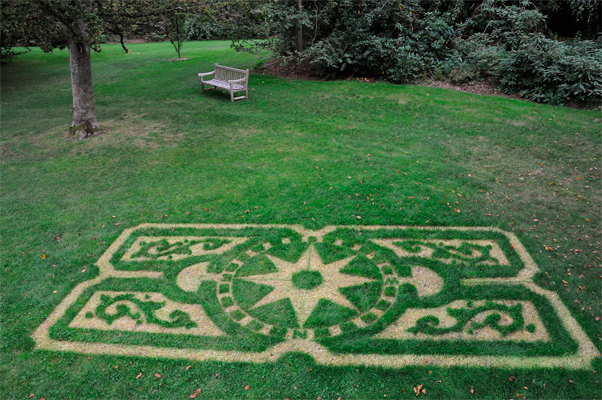 Parterre Carpet. 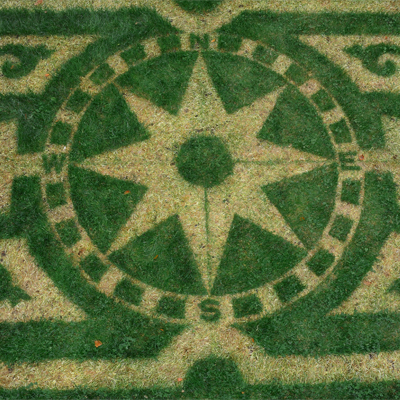 Suppressed grass pattern on the Great Lawn inspired by the Orangerie Garden at Versailles. Wood Pattern. Wood painted rust is left on top of the grass for several days. Cardinal directions. The yellow area is where the grass has not been exposed to light. Canna Spiral. 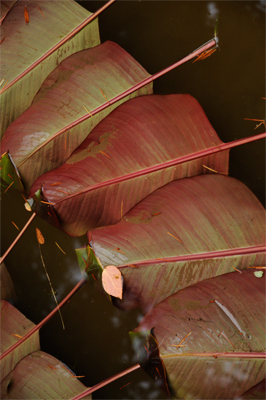 Compared to the engineering needed for formal water features this Canna Leaf floating spiral presents a low tech water design. Canna detail. The underneath of the Canna leaf is a soft salmon color. 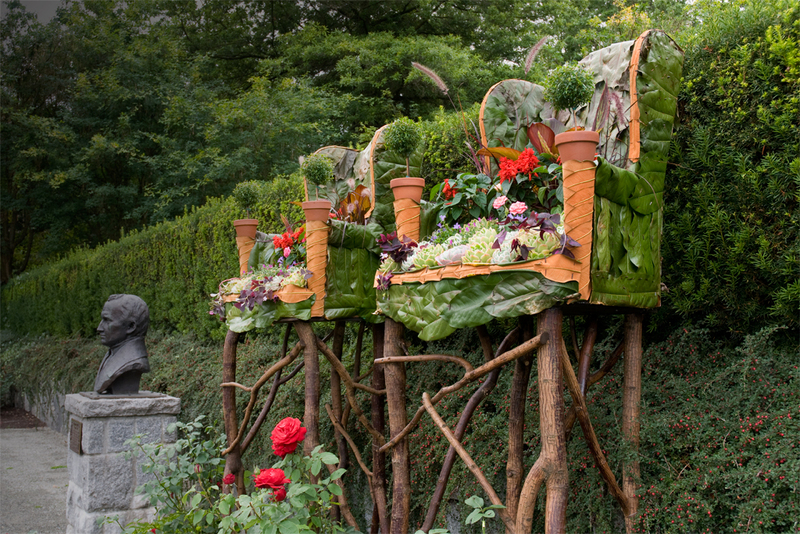 Le Roi et La Reine du Jardin was created during a summer art residency at VanDusen Botanical Garden in Vancouver. 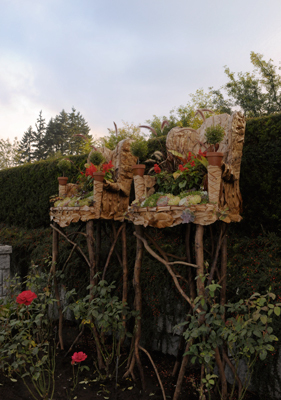 The theme was based on the era of Versailles as the epitome of the formal garden as a display of high culture. The thrones, imagined for the French king Louis XIV and his queen, illustrate the ultimate power of nature over man’s attempts to dominate it. 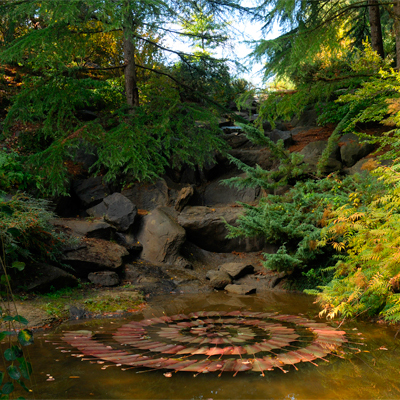 Over the summer I created many outdoor installations with materials gleaned from the gardener’s discarded cuttings such as the Canna Lily Spiral. 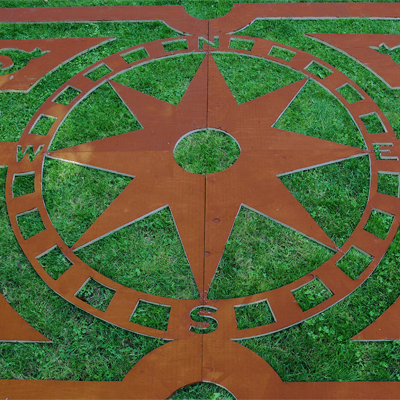 Other pieces were conceived to take shape over time such as the Parterre Carpet. See more projects on my Flickr page. This series was also created in conjunction with the Green Words project.